I’m starting a series where I take the 5th Stumble of the day and write a blog post about it. Why the 5th one? I don’t know, why not? 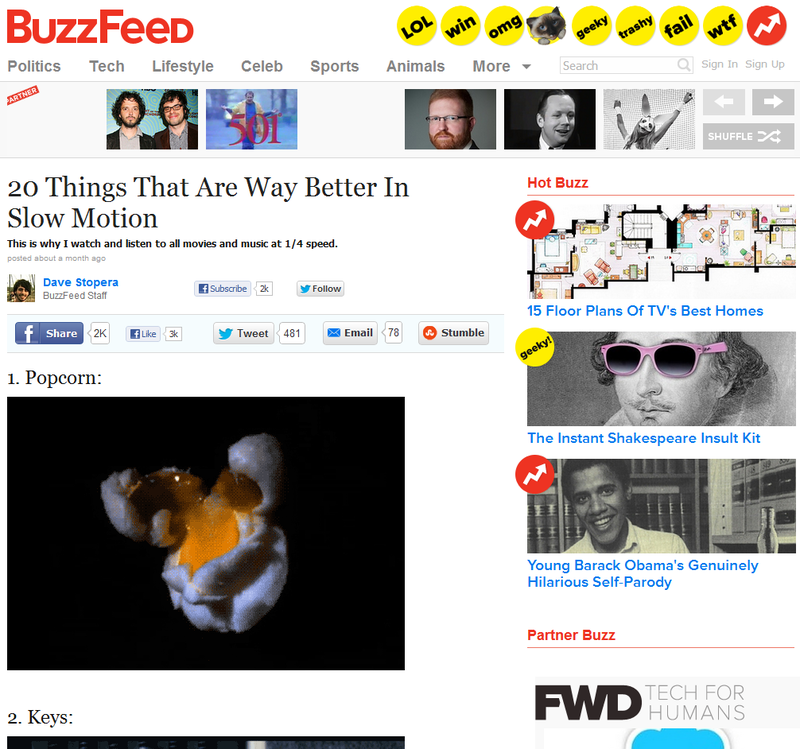 Today’s 5th stumble is: 20 Things that Are Way Better in Slow Motion – [link], from the site BuzzFeed. Note: I’m going to take a screenshot of every page I stumble for this series, just in case the link breaks in the future. This way, someone reading my blog can still see what I am referring to. This random stumble is very coincidental, considering my last blog post was about Light in Slow Motion. What are the chances? That just looks insane. When we look at things in slow motion, we see shapes and patterns that are otherwise never observe. We discover physical phenomena that seem impossible to our natural human-time intuition. At this scale, things happen at time scales so short that that particles zap in and out of existence in billionths of a second. In just a blink of an eye, entire universes of particles have appeared and disappeared, entire realities created and destroyed. Of course, even one billionth of a second is an eternity compared to events that are predicted to have occurred at the onset of the Big Bang. Such events occurred at 10^-34 of a second, or 0.0000000000000000000000000000000001 second. It is indeed interesting to watch man-made objects such as bullets and golf balls in slow motion. But it is far more fascinating to watch nature, whether it is lightning, atomic collisions, and even light itself, move in slow time. The list for The Daily Stumble series is found here.